I was thinking back to all the wonderful cartoons and TV’s shows I use to watch as a kid, and I realized something. I love the way the husband and wife (and sometimes kids) greeted each other when returning home. 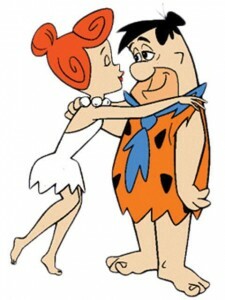 The Flintstones “Wilma I’m home” followed by a kiss. Little House on the prairie A kiss from the wife, and hugs and smiles from the kids. Yeah…you might say those were the days hu? Why not make it your life too? After all, can’t you at the very least use your DVR to freeze the TV when your loved one comes home to greet them. Even if you don’t have a DVR, isn’t your loved one more important than the show/movie you’re watching? We have a lot of distractions that families in the past didn’t have. We might be on the phone and our loved one comes home. Just say “Give me just a moment” excuse yourself from the conversation and greet your loved one when they come into the door. On the computer? Walk away and pay some attention to whoever is coming in the door. It makes a world of difference to know when you’re on your way home, that “home” is a safe place. A place full of love and acceptance. A place away from all the crazy stuff that happens outside in the world, home can be your haven…if you make it such. We all have strife from time to time. Arguments, disagreements. But don’t let those times ruin the love your home can have. Focus on what you want your family life to be, and start working towards that today. This entry was posted in Being Loved at Home and tagged family life, greeting, Love, loving one another. Bookmark the permalink.